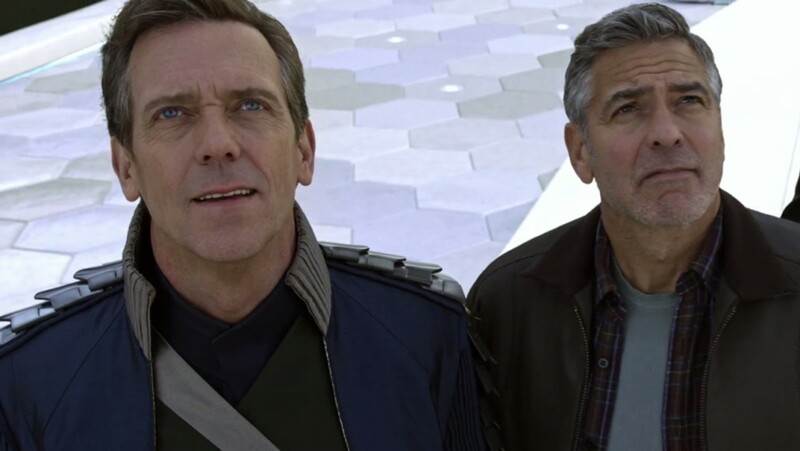 The trailer for Tomorrowland made it look action-packed and interesting. Sadly, the most thrilling aspects of the film are featured in the trailer almost shot for shot. The action is very limited, with the first act being slow, bumbling, and leaving the audience wondering why they should care (before the end of the first act, several groups of people walked out of the cinema). The middle act picks up the action a little, creating hope for some pay-off in the final act. However, we do not get a decent pay-off. Instead, we get philosophizing and confusing, nonsensical plot developments. It’s a shame really, there are a lot of excellent pieces making their way into this film, from the acting talent to the writing and directing. Unfortunately, these pieces are underutilized. When I’d heard that Brad Bird was writing and directing, I was intrigued. His Pixar successes make him an interesting talent. It seems that any positive effect Bird could have had was completely outweighed by the nonsensical inputs of Damon Lindelof (yes, I blame him and have no problem doing so – he has given us some real stinkers, including Star Trek Into Darkness and Prometheus – ‘nuff said, right?!). Meanwhile Clooney is the only actor given much of anything to do (Britt Robertson’s Casey is given more screen time but she almost entirely lacks agency of her own). Hugh Laurie is sadly underused, only allowed to puff his chest and deliver confusing, philosophical diatribes for the briefest of moments. Even Pierce Gagnon, who proved himself an exceptional child actor in Looper, is a pointless addition to the cast. Only Raffey Cassidy has any real spark on screen, proving she’s someone to watch in the future. Casey Netwon (Britt Robertson) is determined that the NASA Launchpad not be destroyed now that the space programme has been abandoned. Breaking into a government facility is a serious crime, however, and she finds herself thrown in the slammer. In amongst her possessions when she’s released is a mysterious pin – when she touches it, she is transported to another world. This world is incredible, full of amazing technology and beauty. Desperate to get there and learn more about this strange place, Casey sets out to discover more about the pin. Her search soon turns into a run when she finds herself the target of an angry android army. 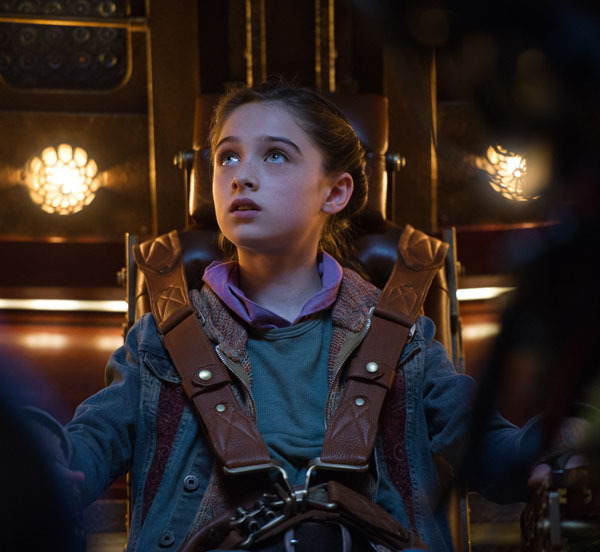 With the help of Athena (Raffey Cassidy), a childlike android, Casey finds Frank Walker (George Clooney), the only man capable of helping her get to Tomorrowland. But getting there won’t be easy, and once she does arrive, what will she find there? The inspiration for Tomorrowland came from a ‘land’ within Disney’s many theme parks – where futurism and optimism abounded. The filmmakers obviously wanted to tap into some of that excited optimistic view of the future that existed in the 50’s and 60’s, when the world was captivated by the idea of going into space. For some reason, however, they tried to recreate optimism by focusing on how pessimistic and defeatist the world has become. In what universe is that a good way to capture an optimistic theme – constantly showing us death, destruction, hopelessness? By the conclusion of the film, we are meant to see that dreamers and a glass half full perspective on life can save this world; that as soon as we stop assuming the worst, good things will happen. Not only is that unbelievably simplistic and unrealistic, it doesn’t even make sense within the world of the film. All it does is remove any sense of threat – and trust me, there’s not a whole lot of that at any point within the film. Who decided that to give a kind of weight to a children’s film and to show a thoughtful learning curve for the protagonist, a child’s parent or authority figure should give them a kind of proverb or saying to hold on to… Then, at certain points throughout the film, the grand realisations that lead to action should always link back to that one proverb? I wish filmmakers would just stop. It’s patronizing and weak storytelling. Children and adults who see these films are perfectly capable of grasping the messages embedded within without the little proverb soundbites. And, honestly, if you want us to press pause on our disbelief for the duration of the film, don’t continuously highlight the fact that the entire thing is a shoddy, fictional construction. What’s even worse in Tomorrowland is that the proverb given to the character is shoehorned inelegantly into the conclusion. You have two wolves, which one will survive/succeed? The one you feed, of course. Casey figures out how to save the world by realizing that ‘we’ve been feeding the wrong wolf’. I mean, WHAT?! By that point, none of the film had made any sense so I’d given up caring, but still, if you’re going to make that the impetus for action in your final act, have it make some kind of sense. Sure, we’re feeding our negative views and making them come true – but linking this back to a proverb about wolves? Really? That’s how you wanna play it?! There was so much wrong with this film I could go on, and on, and on… It’s a total mess. The world is sketchy at best, the characters flimsy, and the plot makes zero sense. It isn’t even a wonderful spectacle of visual feasts – the CG isn’t brilliant and the overall concept and visual design isn’t exactly groundbreaking. This is a children’s film that will be quickly forgotten, or, if it is remembered, pulled out as an example of what not to do. Verdict: Avoid this film like the plague. It isn’t even simply fun enough to be a good Sunday afternoon flick. 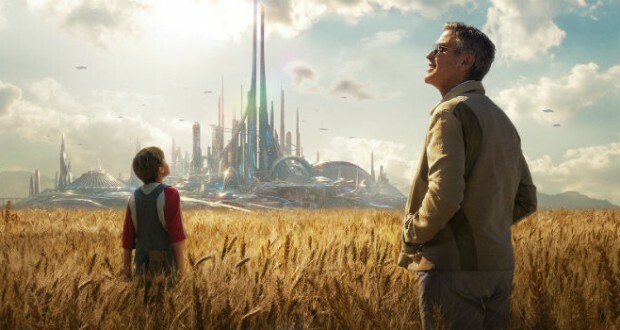 Confusing, slow, and patronizing, Tomorrowland has almost nothing to recommend itself.